Haryana Staff Selection Commission (HSSC) has Issued Call letter/Admit Card for Patwari & Auction Recorder Exam 2015. Applied Candidates May Download their Admit Card/Call Letter. Patwari & Auction Recorder Exam is Going to be held from 01-05-2016 to 08-05-2016. Before Going to Appear the Exam. Candidates must have Exam Call Letter/Admit Card With them. Now Candidates Can Check its Previous Year Question Paper. The Written Exam Will Conducted 100 Multiple Choice Questions & Viva-Voice will be 25 Marks. 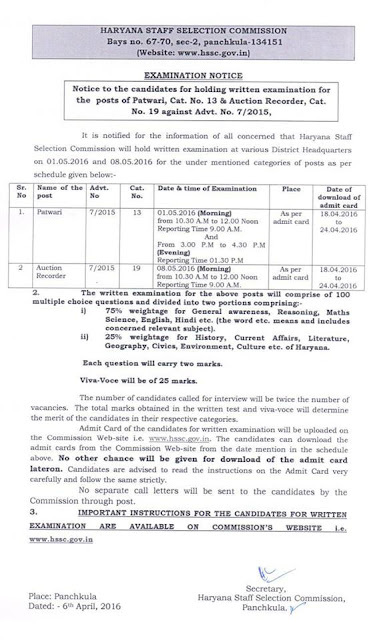 How to Download Haryana HSSC Patwari & Auction Recorder Exam 2016 Admit Card/Hall ticket. 1. Applied Candidates Can download their Admit Card through the official Website. 2. then Go to the Latest Notification Link. Select the Admit Card Link. 3. By Entering Registration No/Roll No and Date Of Birth (DOB)/ Password. You Can Download your Admit Card. Comment Bellow Your Email Id For Previous Year Question Paper.